Bertie Ahern’s blend of endearing naivety and wily opportunism is representative of a peculiarly Irish mindset, which has dominated the body politic for at least the last decade. Bertie Ahern is grinning up at me with scrunched up nose and open-topped shirt. I find him perched comfortably at the top of page 70 of the July 4 edition of the Irish News of the World, where he has conceded that “there are questions to be answered and issues to be resolved” and that “all of the players should realise that it is time to hold their hands up and then move on.” In his capacity as sports columnist for the aforementioned publication, he is of course referring to England’s dismal performance in the world cup. His blend of endearing naivety and wily opportunism is representative of a peculiarly Irish mindset, which has dominated the body politic for at least the last decade. 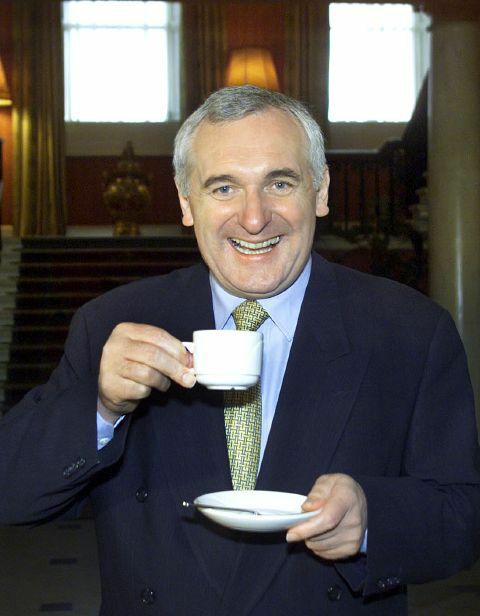 As its most successful exponent, Bertie Ahern stood smiling over the country throughout its period of extraordinary prosperity and glided to a swift resignation conveniently in advance of its crippling economic demise. At the launch of his autobiography last year, he told David Frost that accusations that he had received bribes from property developers were unfounded and based on nothing more than that ‘one guy said that the other fellow told him he did’. A polished Cleggeron he may not be, but his colloquial circumlocution renders him a similarly slick smooth – speaker. The Irish gift of the gab is not just about sliding through the nets though. Our eager benevolence and uncomplicated approachability represent the ideal of a mobilised community spirit. When Joe Duffy spoke recently to a woman living in the west of Ireland who confessed to feeling lonely and depressed in her surroundings, within minutes calls flooded in from strangers offering chats over cups of tea and spare rooms in Dublin, where she was on a housing waiting list. With similar vehemence, homeless charities have launched an impressive campaign against the demolition of empty houses in the outskirts, suggesting instead that they be made available to shelter the homeless. I was born an invincible Celtic tiger cub and have developed lately into a scavenging graduate, competing to take on unpaid work so that some day a philanthropist will discover an archive of my eclectic and unpublished scribblings and plead with me if they may not immortalise them in serialisation – at any price. Like Ireland’s dream of winning the world cup, it is a goal worth striving towards in the strangely reassuring certainty that it will never be achieved. It is this paradoxical conviction of both success and failure, which makes possible the symbiotic relationship between self-deprecation and delusion, which has contributed to Ireland’s staggering economic rise and fall. Bertie Ahern’s curious decision to keep his money under his mattress rather than in a bank account is the mark of both madman and genius, each masquerading as the quietly quotidian everyman, drinking still as Taoiseach in his local pub and insisting on going to Mass every week in spite of his cohabiting relationship with a woman not his wife. Paradox and irony thrive in a culture where emotion is self-consciously privileged over intellect. When Ireland rejected the Lisbon treaty, it did so with an impish ‘let’s see what happens’ attitude. The ‘No’ vote was not an indictment of Europe, but rather a concentrated attempt to get on the government’s nerves. After all, they had burst our bubble. Having wedged ourselves between Scylla and Charybdis, we grinned and voted ourselves out second-time round, much to the annoyance of the UKIP. In a televised debate about head shops, it was claimed by a frustrated liberal that Ireland is a country where laws are set “not by experts but by Joe Duffy”. Indeed, when our former Taoiseach concludes as sports expert from the pages of a tabloid that “no one person should be made to be the scapegoat for what was a collective failure” one can only smile at the audacious success of his opportunism and shake one’s head at the grave irony of his accompanying naivety. This entry was posted in Features and tagged Bertie Ahern, Irish politics, postaweek, postaweek2011, Taoiseach, th by Kate Katharina. Bookmark the permalink. Didnt know you were in London for a short while! Did you get to visit any touristy places? Also wanted to ask you about if this post is relatively Irish? As I can see it’s English BUT I dont seem to be able to understand the contents…..